Barry Allen wakes up in a reality where everything is different. He doesn't have super speed. His mother is still alive. Superman doesn't exist. 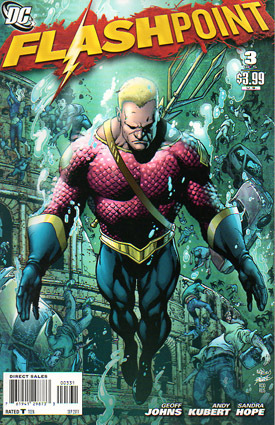 Aquaman's Antlanteans are at war with Wonder Woman's Amazonians, who have taken over the UK. Millions are dead in Europe. Batman does exist but is Thomas Wayne - Bruce Wayne was killed as a child and Thomas is now the vengeful caped crusader. Cyborg is the US security adviser and tries to get an army of superheroes together to protect the US but fails when Batman refuses to be involved. Barry works out that this isn't in fact an alternate reality but an altered version of his own. He works out that Reverse Flash is responsible for the changes. He needs to get his speed back in order to reverse the changes. He attempts to harness lightning to do this. It fails and we see Barry unconscious and covered in burns. The President tells Cyborg he has a traitor working with him and that he intends to send the US military to intervene in the war between the Atlanteans and the Amazonians. He relieves Cyborg of his duties. We find Barry Allen wrapped in bandages in the bat cave after a failed attempt to get his powers back. Even though he is severely burned, he says he needs to try again. His memory is starting to align with the new reality. They try again and this time it works. We see Lois, who manages to make contact with The Resistance. Barry is once again The Flash! Batman tries to persuade Flash to travel through time to alter what has happened. Flash resists saying it's too dangerous. The rocket ship carrying Kal-El hit Metropolis rather than Smallville, around the same time Bruce was born. Cyborg, Batman and Flashbreak break in to Project Superman. They see the skeleton of subject 2, who is probably Krypto. We get our first glimpse of the "S" we know and love, adorning a huge mechanical door. They break in and find a weak, thin and pale looking Superman, who's been locked away all his life, never seen the sun and so hasn't developed his powers. Cyborg breaks the glass to free him before Project Superman security turn up. Our 4 heroes escape, pursued by the Project Superman heavies. Superman gets his first view of outside, his first exposure to sun and starts to fly. 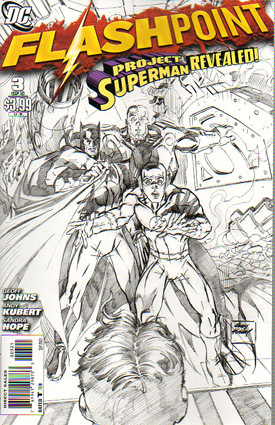 He blasts a gunman with his heat vision and Batman yells at him to get them, before Superman flies off looking terrified, leaving Cyborg, Batman and Flash at the mercy of the military types. 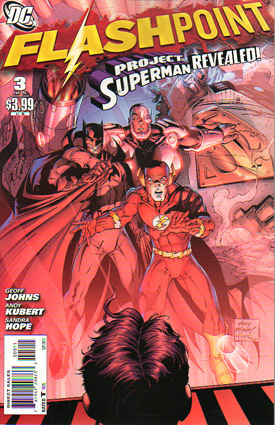 Story - 4: Flashpoint really kicks into gear here, with a pacey and intriguing story and a Superman we've never seen before. Quite how this mini-series is going to end, I don't know, but presumably the end of Flashpoint will lead into the new DC Universe. Things seem finely balanced at the moment. There's a good mix of action and intrigue here and I found myself really rooting for the Flash and co. I loved what they did with Superman. His vulnerability is tangible as is his weakness. It'll be interesting to see how he develops as the key story beats of his growing up aren't there (the Kents, Smallville, Lana, discovering his heritage, moving to Metropolis). Flash's comment 'I can say with all confidence that no matter where he was raised, he's a good person' is a really interesting one. Is this the new Superman? If the re-boot is indeed a way of circumventing the rights issues, and this is the new Superman, they've found a creative and interesting way of re-starting the story. Will we see Superman without an alter-ego? All speculation I know but it's got me thinking. Just one point deducted for the pointless bit of Lois action - we get 9 panels that don't actually add anything to this story, and will presumably be repeated in some way in the Lois Lane and The Resistance books. I'm a fan of Geoff Johns' writing. He gets a balance between characterisation, plot and action that I often connect with. Art - 5: The art is superb throughout this book. Great pencils, ink and colour throughout. The portrayal of Superman, all fear and confusion really made me feel for him. Cover Art - 4: The cover made me want to read the book. Job done.